Dear Baby Gear Baby Blankets are made with 2 separate layers of fabric. The popular printed cotton t-shirt material gets softer and more comfortable with every wash. This blanket is backed with Minky raised dot material, cuddle minky is the ultimate fabric for creating baby blankets, this ultra-soft short pile fabric allows for durability and frequent washings without becoming lumpy or matted. Can be used as a nursing cover, shopping cart seat cover or changing pad. Measures approximately 31 inches x 31 inches. This is the perfect size for use with infants in carriers and strollers. Toddlers can cuddle and carry this blanket without tripping on it. Printed Cotton/Polyester Blend T-shirt Material and Backed 100% Minky Polyester. Machine Wash Gentle Cycle, Cold Water, Mild Detergent Safe for Delicate Baby Skin. Tumble Dry Low Heat, Remove Promptly. Do Not Iron or Press. Do Not Dry Clean. This sweet blanket will quickly become your newborns favorite snuggle buddy. It is the perfect size for your little one to grow into the toddler sleepyhead walking hugging and dragging their blanket behind them stage. The textured fabric lets little ones get a grip as they set off to slumber land nestled in this super-cozy receiving blanket. The charming prints are on a soft cotton blend fabric that reverses to a cuddle minky dot plush back and trimmed with a sensory satisfying satin ruffled edge. 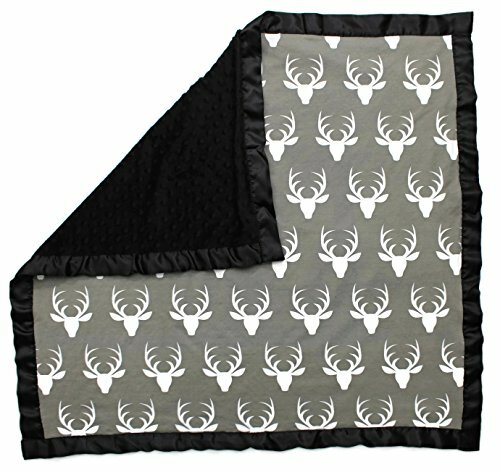 This lightweight to medium weight blanket will provide hours of countless cuddles and measures approximately 32 inches x 32 inches. This blanket will become soft like your favorite t-shirt after washing. Machine Wash Gentle Cycle Cold Water. Mild Detergent Safe for Delicate Baby Skin. Wash With Like Colors. Do Not Bleach. Tumble Dry Low. Do Not Iron or Press. If you have any questions about this product by Dear Baby Gear, contact us by completing and submitting the form below. If you are looking for a specif part number, please include it with your message.